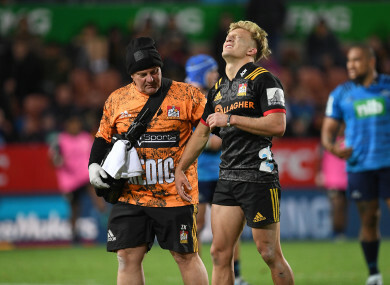 Damian McKenzie suffered a serious injury while in action for the Chiefs against the Blues. UTILITY BACK DAMIAN McKenzie was ruled out of the World Cup on Monday in a blow to the All Blacks as coach Steve Hansen warned it was likely more players could miss out through injury. “He could be out for eight to nine months,” Hansen said of McKenzie, who has been at home playing either fullback or out-half in his 23-Test career, as a squad of 41 All Blacks assembled for the first of two pre-World Cup camps. We’ve got to expect injuries and there’ll be more than just him, I suggest, by the time we finally name the team to go to the World Cup. McKenzie hobbled from the field after a collision with Blues out-half Otere Black one minute into the second half of the Chiefs’ 33-29 win over the Blues in Hamilton on Saturday. Email “Blow for All Blacks as playmaker McKenzie is ruled out of Rugby World Cup”. Feedback on “Blow for All Blacks as playmaker McKenzie is ruled out of Rugby World Cup”.